The Thoughtful House originally was designed with a slab-on-grade foundation instead of a conventional basement. 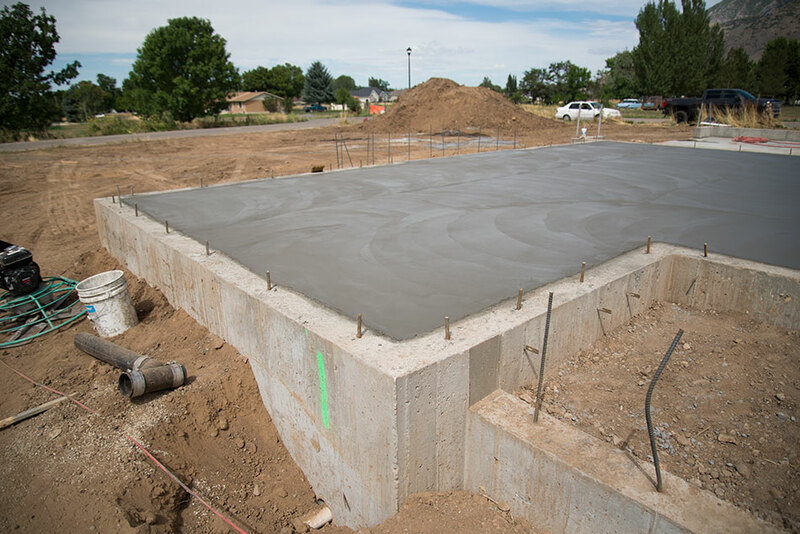 Our reasoning was that slab-on-grade can greatly reduce the environmental impact of construction, it costs significantly less than a basement foundation and we didn’t need or want basement living space. Enter the real world. We soon learned that a slab-on-grade house of the size and type we wanted and in our location wouldn’t appraise at its cost to build without a basement. Basements are so popular in our location, Utah, that appraisers were not able to find enough similar houses without basements in or near our location to compare our house’s value with. After working on this problem for six months and going through several banks and seven appraisers with no progress, we reluctantly compromised and decided to build a basement below part of the house. The house plans quickly appraised after that and we got the go ahead from the bank for construction. Basements are popular in locations that are cold in the winter because the foundation can be buried several feet to protect the footing and basement floor from freezing temperatures that can cause the foundation to heave. 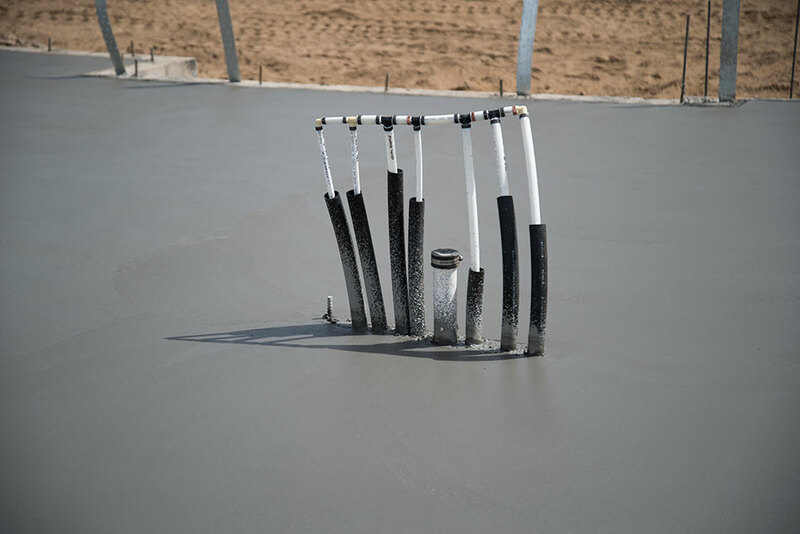 Typically, a single family home in this type of a climate begins with a poured concrete footing followed by thick foundation walls, generally 8 to 10 feet in height, and then a concrete slab. 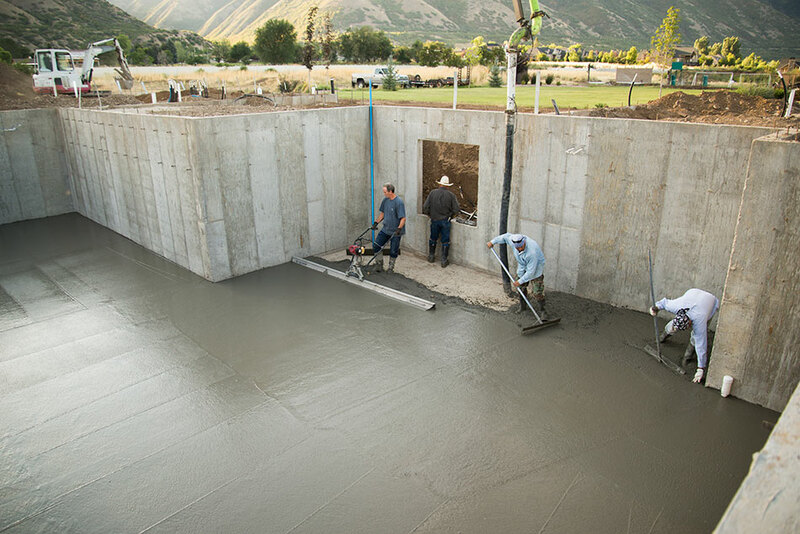 The basement of The Thoughtful House, shown here with the slabs being poured by A2Z Construction, is an example. Despite their wide popularity, basements have some drawbacks. The extra concrete to build them is expensive and releases greenhouse gases into the atmosphere. A subfloor must be added on top for the first floor. Basements also carry an increased risk of flooding and, if improperly constructed, an increased risk of mold compared to slab-on-grade houses. The added living space they provide lacks as much natural light as above-ground construction has unless they are on a slope and have a walkout section with windows. They also need to be finished to be functional, which adds to the cost of a house. The main advantage of a basement is extra living space, including the space for the mechanical room which has to go on the ground floor in a slab-on-grade home. Plumbing systems also are accessible from a basement or crawl space but not a slab, where they can’t be easily modified. This photo shows plumbing embedded in concrete in a slab-on-grade section of The Thoughtful House. In our case, as we didn’t need the basement living space, we kept the basement to the size we needed to make the appraisal. We plan to use the space for a creative studio and woodworking shop. All of our living space still will be above ground, with about two-thirds of it either slab-on-grade or on a partial second floor and the rest over the basement. Building above ground helps maintain clean interior air quality and slab-on-grade construction helps regulate interior temperatures and keep a house cool in summer. As we discovered with our basement dilemma, it’s important to consider financial requirements, local zoning laws, engineering limitations, height restrictions and minimum square footage requirements imposed by some CC&Rs when deciding whether to build slab-on-grade. 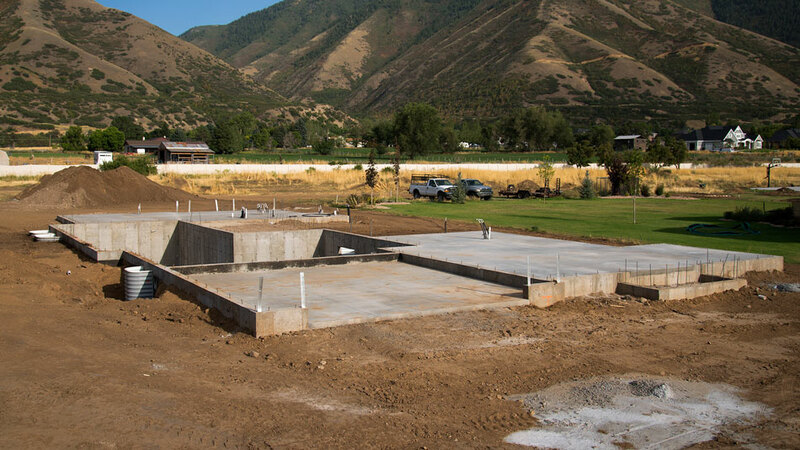 Our foundation was poured in a three-stage operation during which footings were poured, then the basement walls, then the floor slabs after the footings had cured. 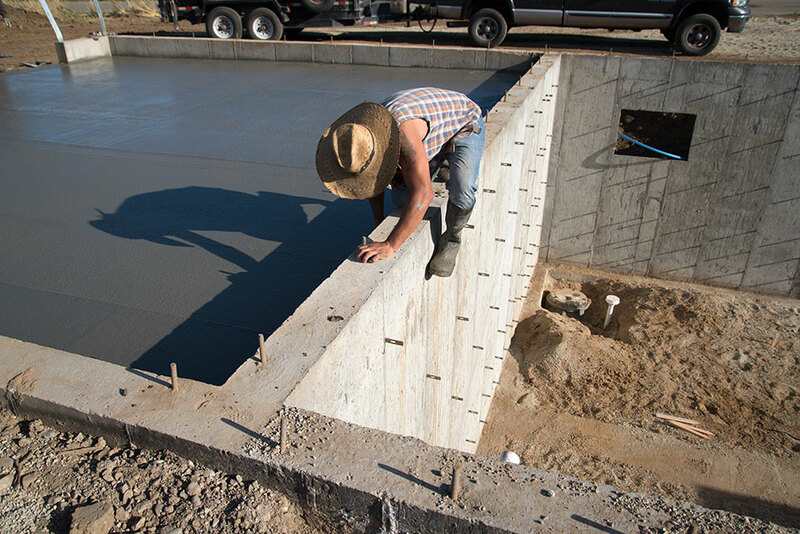 In some houses, a monolithic concrete slab is designed instead so that footings and the slab floor are poured at the same time. 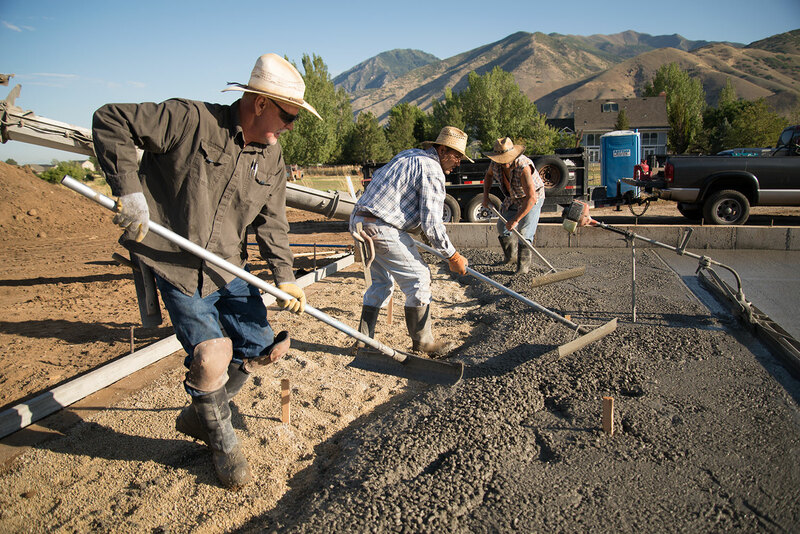 As the concrete was poured, it was leveled out roughly, then smoothed out in two more stages of going over it. Finally after it dried, it was polished. Our basement/slab-on-grade dilemma has been among a number of situations in which we have had to make some compromises between environmentally friendly building practices and financial, legal, aesthetic or other requirements that developed from other priorities. As one green building professional told us, green building is on a continuum. We have generally tried to go for the greener choice, but in some cases such as this one, we have had to compromise in order to get The Thoughtful House built in our location.